Our task is to trace the steps from Genesis through to the development of the NT concept of Gehenna – translated as “hell” in our English Bibles. Many of us will be familiar with the fact that there are also other words which have been translated as “hell” in our English Bibles. Sheol = The Hebrew word in the OT used for the place of the dead. Its meaning moves between the ideas of the grave, underworld and the state of the dead. It is used over 60x and most frequently in the Psalms. Hades = The unseen place of the departed – the lower regions – the grave. It is the Greek word substituted for Sheol by the translators of the Septuagint LXX (200 BC). It is used in the NT 10x. Only in Luke 16:23 are people spoken of as being conscious there – yet in a parable! Tartarus = The deepest abyss for the incarceration of disobedient “angels.” The term is used only once in 2 Peter 2:4 but shows up in the Jewish writings that pre-date the NT. Gehenna = Used 11x in the NT. Ten of those times by the Lord Jesus himself in the Gospel accounts and once in James 3:6. The Hebrew term Gehenna is derived from the Hebrew ge-hinnom, the Valley of Hinnom, which lay just outside ancient Jerusalem. Was Gehenna a Perpetual Burning Rubbish Dump in the 1st Century? It has been popularly said that the Lord Jesus borrowed the imagery of Gehenna from a perpetually lit rubbish dump outside Jerusalem that was used for consuming the cities rubbish and even to destroy the godless. It is understood that such graphic imagery would have helped Jesus to convey what the end-time judgment will be like. Apparently this idea was first written about in a commentary by a Rabbi by the name of David Kimhi who lived around A.D. 1200. However, this notion of Gehenna as a perpetual rubbish dump has been contested by some notable scholars. Herman Strack & Paul Billerbeck, scholars of Judaism and its related writings, state that there is neither archaeological nor literary evidence to support this claim in either the early intertestamental literature or later rabbinic sources. In 1986 Lloyd R. Bailey in his book “The Topography of Hell” came to the same conclusion. There is evidence, however, that part of the valley was used for a cemetery over many centuries due to a number of burial chambers that have been found there by archaeologists (6th cent. BC – 1st cent. AD). Also the Romans apparently performed cremations there in the first century. Perhaps these facts may have influenced Rabbi Kahli’s speculation that the valley was a perpetual rubbish dump in Christ’s day. So if the Lord Jesus did not draw his imagery from the popular concept of the “rubbish dump” where did he draw the concept from? To answer this question we now turn to the OT account of Genesis to see if we can find any reference to its origin there. At the outset we notice that the “Valley of Hinnom”, from which developed the concept of Gehenna, was nowhere near the Garden of Eden which we read about in Genesis chapters 1-3. It was geographically located just outside the city of Jerusalem in the New World following the Flood. However, what we do find at the outset of the OT is the all important general theme of “Judgment” which we could liken to an umbrella under which all later concepts, such as Gehenna, need to be considered. This would be the model, or pattern followed in the OT sacrificial system, upon which we would be redeemed by our Lord and Saviour’s atoning death as our substitute. Therefore, the judgement of God, upon Sin, was death. “The wages of sin is death!” (Romans 6:23). 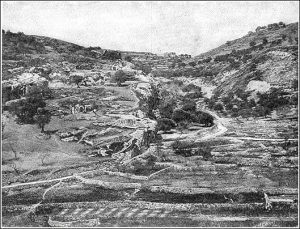 So thus far, from the very outset, there is no mention of the “Valley of Hinnom”, from which developed the concept of Gehenna, until we read of it for the very first time in Joshua (near the end of the 15th century B.C.). We are introduced to it after the Israelites had entered into the Promised Land of Canaan when the land was being described for allotment to the tribes of Judah and Benjamin. “Then it ran up the Valley of Ben Hinnom along the slope of the Jebusite city (that is Jerusalem). From there it climbed up to the top of the hill west of the Hinnom Valley at the northern end of the Valley of Rephaim (Josh 15:8). So, thus far, the Valley of Ben Hinnom is described as nothing more than a geographical location. We now pause to consider what took place in this valley. But before we do, I want to draw attention to the fact that many people believe that God is cruel and unfair because in the book of Joshua, from which we have just read about the Valley of Ben Hinnom, God instructed the Israelites to destroy all the human life in the land which God had told them to take possession of. Why? Well for one reason the existing inhabitants of Canaan, whom the Israelites were told to disposes, through annihilation, had been sacrificing their children to a god by the name of molech for centuries. This practise was a detestable way of treating human life in the eyes of the Sovereign God who made heaven and earth. In other words, do not follow the evil practises of the Canaanites, whom God used the Israelites to remove from the land, after the land becomes yours. Who was Molech and where or what was Topheth? Who was Molech and how were the Canaanite’s children sacrificed to him? In the Valley of Ben Hinnom there was what was termed a high place called Topheth. The etymology of the word Topheth might suggest a fire place and also shame. It was here that the Canaanites burnt their children to death in the fires lit for sacrifice. This was appalling, detestable, and inconceivable. No wonder these people had to be destroyed. It is difficult to imagine any culture on earth becoming so depraved. However consider this: King Ahaz of Judah (732-715BC), 7 centuries after the Israelites entered the Promised Land, along with making cast idols for worshipping the Baals, sacrificed his sons in the Valley of Ben Hinnom. However, if that is not enough, King Manasseh of Judah (696-686 BC) continued the practise into the next generation. The grandson of this evil King Manasseh, Josiah, who came to the throne at only 8 year old (640-609 BC), attempted to reform Judah in the hope of averting God’s judgment upon the nation for these practises. How could the Jews, of all people, stoop so low? These practices certainly put colour into the geography of Ben Hinnom now don’t they? We note that our contemporary traditions around the NT Gehenna (as a place for disembodied eternal conscious torment) is not remotely related to what we have looked at so far. Anyway, what was God to do with his chosen people? We now turn to consider the writings of the OT prophets, in regards to the geographical location of Ben Hinnom, in search of further illumination to the development of the NT concept of Gehenna that the Lord Jesus used. Jeremiah is the only prophet to take up the imagery of the Valley of Ben Hinnom in his writings. He does so in order to use the graphic horror of fiery sacrifice in order to confront Judah’s sin. Although Jeremiah is the only prophet to draw on the place name Ben Hinnom in the prophet Isaiah we do have one reference to Topheth which was the high place in the Valley of Ben Hinnom for these child sacrifices. We see here, in Isaiah, that Topheth has been conceptually modified into a place prepared for a future judgment upon Israel’s enemies. The “king”, to whom the prophecy is referring to, is the king of Assyria (see Isa 30:31). It is interesting to note how familiar the language of the breath of the Lord is in the way it sets its wood on fire and a stream of burning sulphur sets it ablaze. (Compare Rev 14:10; 19:20; 20:10; 21:8). However, Jeremiah’s conceptual modification of Ben Hinnom, I think, is of the greatest interest to us this afternoon as we pursue this subject; particularly in light of his message being delivered in relation to the imminent judgment upon Jerusalem by the Babylonians. Now, for the first time, the Valley of Ben Hinnom has become a scene of future judgment upon those of Jerusalem. It is a judgment that bears strong similarity to how the earlier Kings Ahaz and Manasseh sacrificed their children to the god Molech. The cup that they filled up is now the cup which the prophet has them drinking from. Notice the familiar end-time language of the birds of the air and the beasts of the field feeding on the slain (compare Rev 19:21) – but more importantly note that it is the Jews who are in view here! Let’s read some further on in Jeremiah chapter 19 of this use of Ben Hinnom as a place of judgment against Jerusalem. Ben Hinnom is referred to once again in Jeremiah 32:30-41. However, in that chapter, we are told that even though they sacrificed their children in Ben Hinnom, God will still show mercy on them and gather them back to Jerusalem following the imminent Babylonian invasion. So from the writings of Jeremiah Ben-Hinnom appears to have been used as a Jewish prophetic metaphor for temporal historical judgments upon the Jews. These prophecies on Judah and Jerusalem should be factored in to our considerations of the concept of Gehenna, under the general umbrella of God’s Judgment, when we read of it in the NT. So what do we now find in our 10 usages of the concept of Gehenna off the Lord Jesus own lips (Matt 5:22, 29-30; 10:28; 18:9; 23:15, 33; Mark 9:43, 45, 47; Luke 12:5). Firstly, in the very Jewish book of Matthew, note that it is used 6 times. Yet in the very Gentile book of Luke it is used only once. Only in the one reference in Mark (9:48) does Jesus combine the term Gehenna with the imagery of the “unquenchable fire and worm that dieth not” that we find in Isaiah 66:24. In Isaiah those who are subjected to the unquenchable fire and non-perishing worm perish! It is only the righteous in verse 22 who are said to endure before God. This is not an ethereal image but an image rooted in this physical world. The wider context of the chapter, in which we find this “fire and worm” verse, tells us clearly that the ungodly are slain (Isa 66:16). Further, the other well known imagery of the “weeping, wailing and gnashing of teeth”, which has its origins in Psalm 112:10, is never connected to the technical term Gehenna (compare Mt 8:12; 13:42, 50; 22:13; 24:51; 25:30 and note that all the references are in Matthew). It is, however, used to convey that the Jews, who thought that they were guaranteed heirs of the Kingdom, will react this way when they are shut out and others, whom they naturally excluded, are invited in. From the original source in Psalm 112:10 these, gnashing their teeth, are said to waste away and all their hopes perish along with them. We find that that this term Gehenna is being used, in its original setting, to address Jews who presumably would have known of Jeremiah’s development of the concept into a future judgment reserved for Jerusalem’s sin. So, was the concept of Gehenna, as developed in the writings of Jeremiah, intended for a specific audience’s ears? Was Jesus drawing on the Scriptural associations that his original Jewish audience would have been familiar with? Why such an Absence of Gehenna in the Rest of the NT? The reason that I ask this question is because the term Gehenna is never used in Acts, in Paul’s writings, Peter’s writings, John’s writings and even in the Book of Revelation with all its graphic apocalyptic imagery. James does not give us many clues as to how the fire of Gehenna can light the tongue. Perhaps James is drawing associations with the level of depraved evil, practised in historical Ben Hinnom, as a similar evil which can motivate the misuse of the human tongue. Certainly he is writing very creatively. If the Lord Jesus teaching on Gehenna was aimed at a particular Jewish audience, for which the concept of Gehenna was a prophetic judgment upon Jerusalem, as we have seen in the writings of the prophet Jeremiah, is it appropriate that we use it today? None of the NT writers used it but for James. Or should we treat the technical concept of Gehenna as a concept synonymous with the future judgment of fire? There are many references in the NT to fire being the agent used in the final judgment to purge the world of sin (e.g. 1 Cor 3:13; 2 Thess 1:7; Heb 10:27; 2 Pet 3:7). Perhaps using the term “fire”, is a much less loaded word than using the prophetic Jewish concept of Gehenna? Perhaps the technical term Gehenna simply didn’t hold currency in the Gentile world. So what do we all think? Gehenna and Hinnom have very different meanings from Sheol and Hades. The former has to do with judgment for sin while the latter has to do with afterlife. Traditional theology has muddled the two issues and thus arose the idea that there is a hell after this life to which some people are consigned forever. The truth is that hell occurs in this life as we disobey what we know is right. As for afterlife, everyone is going to heaven – though not to the same place, orsame glory, in heaven. Interesting thoughts. Do you have a biblical basis for your conclusions? I appreciate how you try to understand the word “hell” in its original context. I agree that Jesus seems to use hell the same way Jeremiah did, to pronounce coming judgment on God’s rebellious people. I wonder, however, how you might deal with Matt 10:28 (cf Lk 12:5). There, Jesus seems to say that, after the body is killed by man, God then executes judgment in hell. My take on it is that Jesus is only making the point that they should not fear their persecutors, but rather they should honor God by proclaiming the gospel boldly in light of the fact God is bringing judgment on these very persecutors. And he uses the language of “hell” in order to highlight what kind of judgment he is talking about–judgment similar to the judgment God brought on his rebellious people during the days of Jeremiah. He thus conjures up this image of judgment by explicitly describing it in very graphic terms–first, you will be killed, then your body will be thrown in the Valley of Hinnom where you will be completely destroyed. So, the point is to assuage the fear of his disciples by reminding them of the judgment that awaits people who persecute them. Hi Raul. Thanks for your great thoughts. It seems to me that Matthew 10:28 & Luke 12:5 appear a little different in what they are saying (at least on a surface reading) when compared side by side. In Matthew Jesus seems to talk about fearing God who can destroy both body and soul in hell. Yet in Luke Jesus seems to be suggesting that God, after killing the body, has power to throw one into hell afterwards. How one will interpret what is going on depends on what pre-conditioning ones brings to the task i.e. what does “soul” mean and what and when does this “hell” (Gehenna) take place? In my mind there are gaps that our particular understanding which is dependent on our preconditioning. For me personally I have come to understand the word “soul” as meaning the whole person rather than understanding the term as the Greek philosphers did i.e. an immaterial phantom of the real person that is not subject to death but leaves the body to go to a spirit relam when the body breathes its last. Also, my understanding of Gehenna, if the term isn’t limited to a Jewish understanding of how the OT prophets used it, is a future judgment day where the resurrected dead will give an account. So on that basis, when I read Jesus’ words in Matthew’s account I think he is simply saying “God can (and will) destroy everything in that future judgment. So, that future event is to be feared much more than men taking our lives prematurely in this world. Many have used this verse as evidence that the body and soul are two seperable entities. I had wondered if Jesus, perhaps, is addressing those who themselves may have been cultured to think this way by saying “no! the soul is not an immortal phantom of the mortal body. Rather God will raise us from the dead completely and either save or destroy completly. A well known scholar, R. T. France, in his comentary on Matthew says – “The interntion is not to seperate man into two parts “body” and “soul” but to point out that there is more to man than animal existence … “Soul” and “body” are again not two seperable parts of man, each alone, and both together, can be used to indicate the whole person. The emphais here is on the total and final destruction in hell, as opposed to the limited nature of merely physical death.” Did you notice that Jesus says “destroy” in the verse and not kept in perpetual torment and this relates to the “body?” Luke’s account – this is harder to tackle, as a conditionalist, than Matthews account. Here it does give you the impression, as you have pointed out, that the body dies and then something remains which is thrown into “hell.” However, I understand Gehenna to be a future fire. In other words it is not burning today in a spirit realm. So, I guess I would look at this verse and say “fear God because your life in this world is in his hands” and “after your life is ended the real fear is that he can throw “you” into hell. In my mind, not as an immaterial phantom seperated from the body, but as a resurrected whole person at a future point of judgment in time. Again how one is pre-conditioned to understand the words “soul” and “hell” will determine how one reads these verses. Much arguing and hard feeling can be generated over verses such as these (which I don’t intend to do) and I guess it can be a little frustrating on the side of the conditionalist to not know how to say that more foundational issues need to be explored if one can appreciate how a conditionalist interprets these excellent verses that you have brought up. Thanks again for your thoughts. I hope some sense can be made of my ramblings. Excellent. Thank you. I did not initially get the feeling from your article that you would say Jesus’ reference to hell can indeed refer to final judgment. But in light of some of the ways he describes hell (such as Matt 25:41, which refers to “everlasting fire” in reference to what I think most would say is clearly referring to final judgment–keeping in mind that “everlasting fire” and “hell” are used interchangeably in Matt 18:8-9), it does seem problematic to assert that Jesus uses the concept of hell purely in terms of the judgment that came upon Jerusalem in AD70. Anyway, thanks for clearing that up for me. Yes, thanks Raul. When I gave the address at conference I think some people may have thought that I was limiting the menaing of Gehenna to 70AD thus opening up the door to the possibility of Universal Reconciliation. I certainly don’t see any convincing Scriptures to suggest that. In my mind, just as in numerous OT prophecies that have come to my attention, sometimes the prophets words can have a temporal imminent meaning and also contribute to a larger distant future picture as well. I guess I had wondered if Jesus use of Gehenna may do this also – not sure about this though i.e. the generation of Jesus day may have seen certain OT judgments (such as the Ben Hinnom prophecies in the article) finding a fufillment in 70AD but also contributing toward our undestanding of the judgment by fire at the end of the Age. The way I ended the article was intentionally open ended to generate some discussion. Thanks for your stimulating reflections. What is your view with regard to the Rabbinical/Targumic references to Gehenna from Jesus’ time? The Targum Jonathan paraphrase of Isaiah 66:24 makes it about post mortem torment, changing the “worm” to the “souls” not dying. Jesus didn’t quote the Targum but nevertheless, do you feel it is possible that Jesus’ audience may have understood his words as referring to a Rabbinical/Apochryphal definition of Gehenna as a place of torment? Hi Tim. I’m not familiar with Rabbinical/Targumic references. However, about 7 years ago a young women at college did a dissertation for her Masters which explored much of this material. From memory her conclusions were that Jesus deliberately played on his audiences familiarity with this material. I’m not so sure – however I’m not informed enough to really know. Nevertheless I would certainly think that some of Jesus audience, if not most, would have heard his words through the conditioning of this extra-biblical material. I guess that then raises the question was Jesus happy for them to hear him through that conditioning? He was certainly happy enough to draw on one of their traditional stories in the telling of the parable of the Rich Man and Lazarus to make his point. I guess another point that I have wrestled with is the fact that Jesus never clearly goes about trying to correct what we Conditionalists say is error in regards to hell being a place of conscious torment. I wish he had! Instead we’re left weighing up all of the biblical data in order to determine what seems to make the most sense of scripture and then to put our best case forward. It’s no wonder there is much debate on the topic.